Leftover steak. To some this is a novel concept, even an oxymoron. If that’s you, forgive us and have a chuckle at our expense. But if you’re the sorta person who occasionally gets carried away and impulse buys an extra rib eye or strip—or 3—when you’re standing at the butcher counter, then you know what we’re talking about. Rest assured, leftover steak works really quite splendidly in this steak sandwich. Simply sizzle the cold steak in a cast-iron skillet to warm it, then follow the directions from there. Use an extra drizzle olive oil if the reheated steak’s resting juices are scarce. 1. Remove the steak from the fridge, place it on parchment paper, and let it rest for 30 minutes or so to come to room temperature. 2. Meanwhile, peel the onions, removing the papery outer layer as well as the first layer of onion (reserve this for chicken stock, vegetable broth, or soup). Slice the rest of the onion into 3/4-inch-thick rounds. Place the bay leaves, butter, a glug of oil, and the sugar into a large frying pan or cast-iron skillet on medium heat. Once the butter melts, place the onions in the pan in a single layer, season with salt and pepper, and cook for 5 minutes. Pour in the vinegar, pop the lid on, reduce the heat to low, and cook for around 35 minutes, or until beautifully golden and caramelized on the bottom only, adding splashes of water to loosen if needed. Remove and discard the bay leaves, if desired. 3. Meanwhile, pop the ciabatta in the oven, turn the oven to 225ºF (107°C), and let it alone until it’s warmed through. 4. If desired, place 1 sprig rosemary beneath the steak and 1 sprig rosemary on it. Cover the steak with parchment paper and bash it with the bottom of a heavy pan to make it roughly the same thickness throughout and to tenderize it. Season the steak all over with salt and pepper. 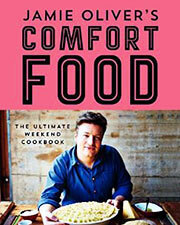 Place a large nonstick heavy-bottomed skillet on medium-high heat. Once the skillet is screaming hot but not smoking, drizzle the steak with olive oil, then put it in the skillet and cook for 3 minutes on each side for medium doneness, or for more or less time to your liking. Place the steak on a plate and let it rest for 1 minute or so. Then slice the steak 1/2 inch thick and toss the slices with its resting juices and a drizzle olive oil. 5. Cut the warm ciabatta in half lengthwise. Rub the cut side of the ciabatta with the steak’s resting juices, then spread on some mustard, if you like. On the bottom half of the ciabatta, layer the caramelized onions, the steak, and a little lemon-dressed watercress. Plop the remaining ciabatta on top, press it down lightly, carve it into decent chunks, and get involved. 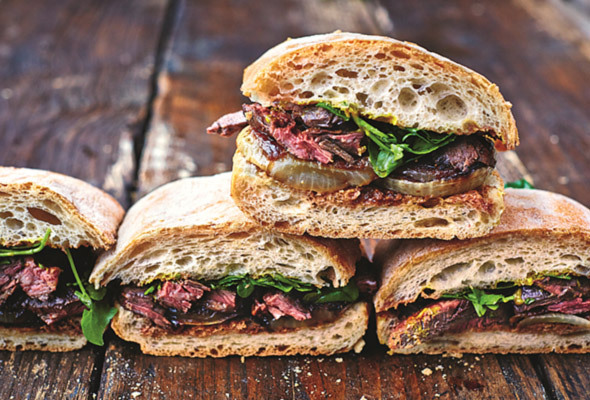 Steak Sandwich Recipe © 2014 Jamie Oliver. Photo © 2014 David Loftus. All rights reserved. All recipes and photos used with permission of the publisher.